Any mouse – A lockbox on Navy ships where sailors may drop anonymous suggestions. Ate-Up – Describes a servicemember who follows regulations so closely that they disregard the context of the situation. Conversely, may describe a servicemember who doesn’t understand regulations at all. Bitchin’ Betty – Most U.S. military aircraft feature warning systems that frequently utilize female voices. The phrase is derived from the same anthropmorphizing many apply to GPS units in cars, only Bitchin’ Betty’s alert pilots to life-threatening situations. ‘Black’ on ammo, fuel, water, etc. – A common phrase which denotes that a particular resource is gone. Bull Bomb – A package intended to disperse propaganda leaflets. Recommended by user Steve Neal. 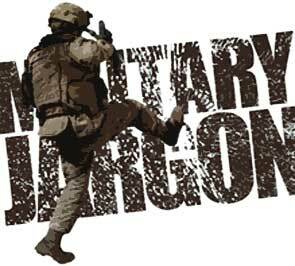 Charlie Foxtrot – Commonly used expression utilizing the military alphabet to stand for clusterf. Crusher – Hats worn by pilots during World War II. The hat’s wide top brim would need to be crushed down to allow for headsets to be worn.